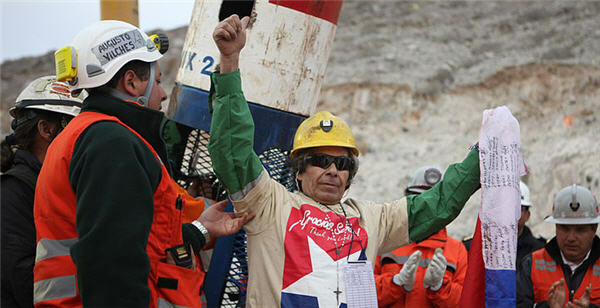 Three years after a Chilean mine collapsed, trapping 33 miners for 69 days and attracting hoards of international media, the prosecutor's office has announced 'case closed' on the legal investigation. The culprit: No one. Prosecutors dropped the probe citing lack of evidence and sparking fury among Chileans, the Associated Press reports. A three-year investigation had been scrutinizing project owners Alejandro Bohn and Marcelo Kemmeny and the country's mining ministry's regulatory unit. "This is a disgrace to Chile's justice system," Mario Sepulveda, one of the trapped workers told the AP. "It's impossible that in an accident of this magnitude no one is held responsible." On August 5, 2010 Sepulveda and 32 other miners at the 120-year old San Jose gold and copper mine became trapped 2,000-feet deep when the mine collapsed. For two weeks no one knew if they were alive. Then, for more than two months international media swarmed San Jose and one billion people tuned in to see the workers finally rescued in October 2010. San Esteban Mining – the company behind the project – had a history of poor safety performance, the New York Times notes. In the six years leading up the 2010 accident, two miners lost their lives as a result of two separate cave-ins. In 2007 a geologist died in an explosion. The court's decision comes in spite of a 2011 congressional commission's finding that San Jose owners were in fact responsible. Hernan de Solminihac, the country's mining minister, said he could not give his opinion but he hopes the miners' civil lawsuit will stay "on the right track," AP reports. A civil suit has been filed and will proceed, a lawyer for the workers told the AP. So far, compensation for the former employees has included a $10,000 gift each from Chilean billionaire Leonardo Farkas, and 14 miners were given lifetime monthly pensions of about $540 by Cecilia Morel, Chile's first lady. Bohn and Kemmeny have been billed with 25% of rescue operation costs, which ran the government about $22 million. Meanwhile, Hollywood has taken a keen interest in the miners' saga, with producer Mike Medavoy buying the rights to the film in 2011. Earlier this year he announced that Antonio Banderas would star as Sepulveda. Sepulveda hit the limelight during the two-month ordeal, earning himself the title of 'Super Mario'.